Welcome to the Starving Artistamps Blog Hop! Starving Artistamps is releasing new DoodleFactory stamps called - Set the Scene Backdrops! These new background stamps are about 3-3/4" x 5" and a great addition to your DoodleFactory Stamps, or just by themselves! You can choose from the following Backdrops - Tropical, Countryside, Rooftops or Jungle. I used the Tropical Backdrop on the card I've created. I stamped my image on Watercolor paper in Black Archival and colored using the Marker Water Coloring Technique, then stamped my sentiment in Black Archival. You can save 10% on your StarvingArtistamps DoodleFactory and Starving Artistamps Stamp lines by using the code savetenls. Love the colors on this, Lisa! My GOSH - that looks REAL!!! Wow! Absolutely gorgeous! Love the watercoloured effect! I really like the water coloring on that! It looks so serene! I love the dreamy look in this card. LOVE the texture! Fantabulous coloring too! What a beautiful job on the watercolouring, it really give the background a "wow" factor. I love these backdrops - they be good for a variety of occasions! Watercoloring looks so pretty on this scene! What a pretty card, love it! So soft and pretty. You know im a big admirer of that coloring technique. I really have got to get me some of that luscious paper! Beautiful technique, Lisa!! I love the look it gives!! So gentle and serene!! Love it Lisa! What a fun new line! A stunning card, love your soft colouring which is perfect for the scene. I like the soft, muted tones...I think they bring out the sand very well! Beautiful coloring and I love how all you added was that perfect sentiment! Wow, what a wonderful peaceful scene, I want to go there now! LOL! Beautiful creation! OMG. I just want to take a swim. What a great card. How cool these backgrounds are! Wow, great coloring! This tropical background is wonderful. Gorgeous! I love the way you made your card, even with no additions to it it is absolutely amazing!! I want to go there!! Hello there, dearie! 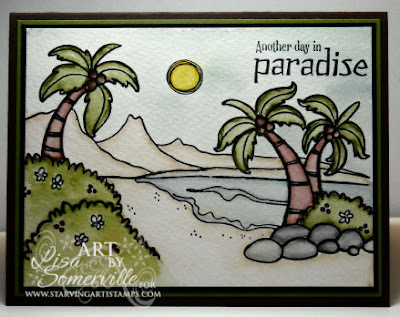 Love your beachy card...makes me NEED to be at the beach in warm sun NOW. Perfectly wonderful! great color cobo! Very pretty too! How did I miss this?! another fabby card!